There’s been a lot of talk in recent months about the Nintendo 3DS and what the future holds for it. You can frequently see one fan or another pointing to a particular upcoming game release as one that will “save” the handheld, as if it’s in some danger of disappearing. The fact is, Nintendo launched the 3DS with no “killer apps” to speak of and really a rather lackluster launch library overall. Many fans have been looking to the ongoing holiday season as the time when we’ll see the 3DS come into its own. The reality hasn’t really lived up to that; Kid Icarus was pushed to a 2012 release and the only other major 3DS release we saw this holiday was a remake of StarFox 64, and an upcoming Mario Kart that has been kept tightly under wraps. Until now. Nintendo revealed its Mario 3DS game at E3 over the summer, and now Super Mario 3D Land is here. If you’ve been waiting for a system-seller, this isn’t it. Make no mistake though, it might not be a killer app, but 3D Land is the most compelling reason to own a 3DS right now, and by a wide margin. The game’s structure is built purely out of nostalgia, with players running Nintendo’s mustachioed mascot through an eight-world gauntlet, with each world containing a series of sub-worlds — 1-1, 1-2, 1-3, etc. — and a final “boss” castle or airship. Some of the latter day Mario trappings make their way in as well, such as the Toad House where you can receive and store some kind of power-up for later use. The core structure is immediately familiar and simple enough for any fan to grasp, however. I immediately felt the same sense of nostalgia diving in with my first 3D Land level that I did when I first tried New Super Mario Bros. on the DS a few years back. While this is no longer strictly a 2D platformer, the vibe of those classic titles is in full effect. They look a lot nicer thanks to the 3DS’s newer tech, but the fan service at work in the game is immediately detectable. Whether you’re squashing a goomba, sliding down a green tube in an endless pursuit of more coins or simply running against the clock when the music tempo goes into overdrive for each stage’s final 100 seconds, this is undeniably Mario being placed back in his element. 3D Land is most successful for mixing in a whole lot of new in the midst of all that nostalgia. You’ll feel shades of Super Mario Bros. in the platforming, Super Mario Bros. 3 in the power-up storage (and returning Tanooki suit!!) and Super Mario 64 in the 3D layout of certain levels. You’ll collect three special star coins per level, and as that amassed collection grows, you’ll gain access to other levels. This is less an evolution and more a distillation of everything that turns fans of the Mario brand into repeat customers. As much as 3D Land is inspired by the old, the levels you’ll run through are entirely new. There’s a mix of pure 3D platforming, pure 2D platforming and more than a few gimmicky — but extremely well-implemented — fusions of the two. Things start out easily enough; really, the first few worlds you’ll run through are a cakewalk, no question. It’s all just getting you prepared for the gauntlet of insane challenges that await you later on, however. It’s very much a crawl before you can walk dynamic in the progression of gameplay. As I progressed through the worlds and found my attitude turning from “holy crap, this is easy” to “holy crap, THIS CURSED JUMP IS IMPOSSIBLE,” I was struck by a memory of going through the very same feelings the first time I sat down with the original Super Mario. At its best moments, 3D Land capably taps into that nostalgia while offering something entirely new. It’s harder than it was, but it also holds your hand more frequently; fail on a particular level enough times and the game will “reward” you with a golden Tanooki suit that renders you invincible to anything that stage can throw at you other than falling to your death. The trick, of course, isn’t getting to the end of a stage but rather collecting each stage’s three star coins. Invincibility is helpful, but not game-breakingly so. It’s balanced fairly perfectly; Nintendo has become much more of a casual gamer-friendly developer in recent years, but 3D Land seems to recognize where the company’s roots lie. It’s not all perfect fun, however. While the 3D effects are used remarkably well, you’ll often want to turn them off since playing a Mario game — and I mean really getting into it — is rarely an idyllic affair. You’ll move your body around a lot as you play, which doesn’t work well with the portable’s 3D display features. The controls are also not always your friend. While they work well enough, there’s little that can be done to make exploring a 3D world more bearable on that tiny screen. Unfortunately, it’s a pretty big problem; you’ll die frequently because of missed or improperly aimed jumps, more than you ever would have in a 2D environment. 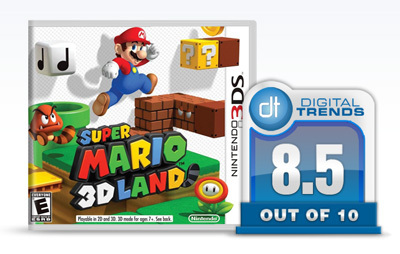 Overall, Super Mario 3D Land is a big win for Nintendo. I’m not sure I’d recommend running out and buying a 3DS just so you can play it, but it’s the first 3DS game I’ve encountered where I really feel confident saying that you must own it if you already have the handheld. Whether or not the 3DS ever reaches the heights of popularity that the DS did remains to be seen, but Super Mario 3D Land at least pushes us considerably further in the right direction.